City officials won’t be criticized on at least two issues when the ever-controversial streetcar starts service on November 2nd. The Hop will launch both on time and on budget. A Thursday afternoon project update meeting featured a breakdown of estimated and actual expenses. Patrick J. Flaherty of the Concord Group, the city’s owner’s representative, detailed how construction has gone on the $99.24 million first phase. He told the streetcar implementation committee that $79.77 million has been spent to date. Flaherty cautioned the panel not to expect the project to come in substantially under budget. Even though the city already has all five vehicles from manufacturer Transdev, it has only paid $8.33 million of a $19.46 million contract. The remaining funds for Brookville and many other vendors are based on “highly specific milestone payments that they need to hit targets on,” said Flaherty. One other issue left to resolve is the utility relocation cost. “We still have final reconciliation,” said Flaherty. The city has spent $8.35 million out of a budgeted $11.81 million. Flaherty noted that We Energies was budgeted to receive over $9 million originally, with “seven to eight” other telecommunication companies splitting the remaining $2 million. The budget news, revealed publicly for the first time, was met with praise from city officials. “I’m already proud of it. And I’m proud of the way people came together to make this happen,” said Department of City Development Commissioner Rocky Marcoux. Bauman, a streetcar champion, also singled out the utility cost. He said that when the project was approved in 2011, We Energies and other utilities estimated a collective relocation cost in excess of $60 million. The downtown alderman said that if today’s figure was known, “we could have resolved that in a couple months.” Bauman estimated that the project could have opened three years ago if not for the years of delay encountered as a result of the utility issue. In addition to being on budget, the project is slated to open on time. Make that nearly two weeks early. A request for proposals to operate the streetcar, ultimately won by Transdev, envisioned service starting by November 15th, 2018. 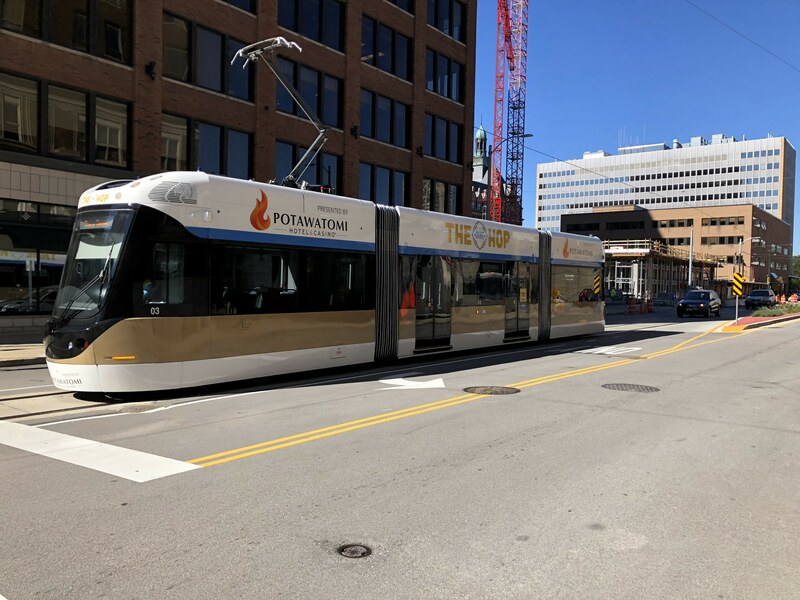 The streetcar, now known as The Hop presented by Potawatomi Hotel & Casino, will begin operating on November 2nd at 1 p.m. The project’s second phase, extending to the lakefront, is expected to open in 2020, later than the original “late 2019” estimate due to delays associated with the financing of The Couture apartment tower. The two streetcar lines have a combined budget of $128 million.